Clinically proven to decrease stressful reactions to loud noises. Proven to help puppies adjust more quickly to new homes ( as shown through reduced number of disturbed nights spent barking, whining and contact seeking.) 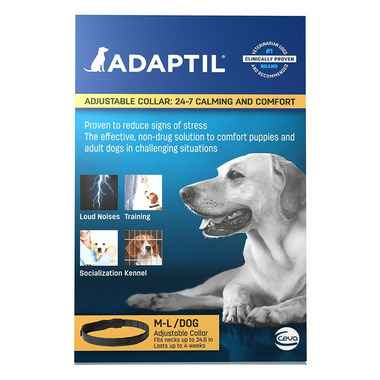 Helps improve socialization skills of puppies and adult dogs. Reduces excessive pacing and barking/whinning in sheltered dogs. Start to see results in 3 weeks. All dogs are unqiue, results may vary. Directions: Change collar every four weeks. Ingredients: Analouge canine appeasing pheromone at 5 %. Excipients q.s. 1 collar 100%.